Given some points on a coordinate system and some radius r, I need to place a circle with radius r somewhere on the coordinate system such that that circle includes the most points. 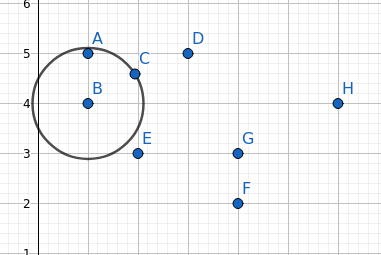 I tried solving it by taking each pair of points and if it is possible, generate the two circles that pass trough those two points and have radius r.
Here I found 2 possible circles that have points a and b on their perimeter with radius 2. 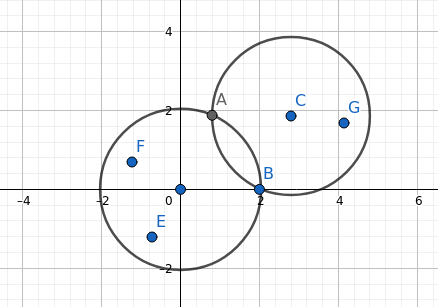 One circle contains most points so that would be the solution of this problem. However, I am not sure that this works. One easy counter example is when we have only one point. No pairs can be generated so no circles can be generated. In my code, I just added a circle for every point in addition to my circle generating nonsense from before. But that also fails to give me the correct result. How do I really go about solving this? Your algorithm is correct. If the best circle contains one point, your post-processing step will find it. If the best circle contains two or more points, then there is a way to shift it around so it contains the same set of points and also two of them are on the perimeter; thus, in this case your algorithm will also find it. There may be other algorithms that are even faster, but your algorithm shows that the problem can be solved in $O(n^2)$ time. Not the answer you're looking for? Browse other questions tagged computational-geometry or ask your own question. given a set of $n$ points in $d$-dimensional space and the basis vectors of some subspace, how to find all the points on that space?